Children's park surrounded by trash.. and traffic.. the blur at the bottom is due to this picture being taken in a moving car.. If that's all rubbish (garbage) in the foreground then that is VERY sad - SIGH! Oh my, you've certainly captured the ugly side of life.....why is there so much trash next to a playground? It's a very good photojournalistic photo, very clear and detailed. 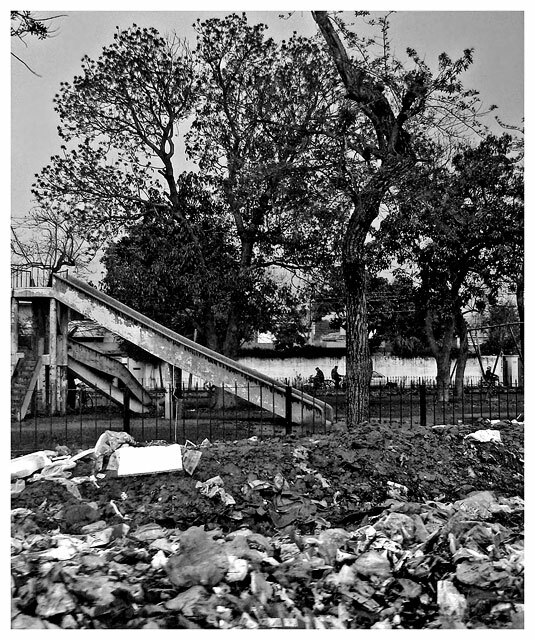 Kinda sad and such interesting contrast to see a place that should have happy children playing enjoying childhood -- yet -- there's rubble, trash and no kids. The stark black and white enhances the mood and that contrast even more. I also find it interesting that thru the rubble, you can see pretty water, and people sitting at a picnic table. Quite a dychotomy in this photo. I like it!!!!! i like the composition a lot in this. the DOF and contrast are very nice. my favorite part of this picture is the little hint of humanity with those tiny distant figures in the background. Proudly hosted by Sargasso Networks. Current Server Time: 04/21/2019 04:41:01 AM EDT.